Want a healthy, tasty, and easy keto recipe? Try this Broccoli Keto Slaw recipe! It makes for a great side dish or topping and contains only 3.7 grams of net carbs per serving! I don’t know about you, but I love a good broccoli slaw recipe. I love the added nutrients from the broccoli, and I find the recipes to be fresh and flavorful. Broccoli Keto Slaw is no different! It’s a great low-carb recipe for those of you on the keto diet, and it’s also a fantastic recipe for anyone looking for a vegetable-focused side dish. Keto coleslaw (or any traditional coleslaw) uses cabbage, which is a very low-carb vegetable. Broccoli Keto Slaw (or any traditional broccoli slaw) uses broccoli stalks instead. Admittedly, broccoli is higher in carbs than cabbage, but Broccoli Keto Slaw is still an excellent choice for the keto diet. 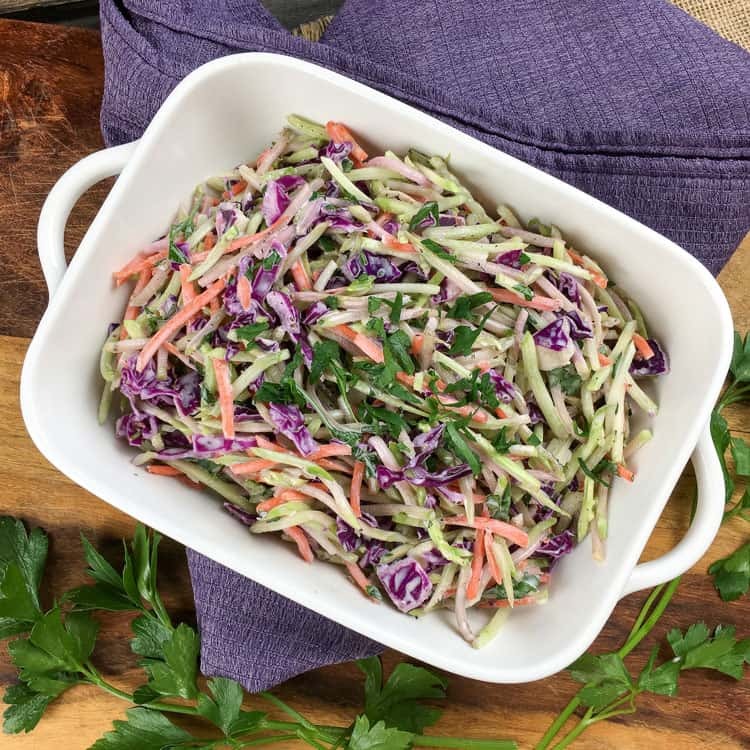 Some broccoli slaw recipes call for sugar, but not this Broccoli Keto Slaw! It relies on the natural sweetness of the vegetables. When it comes to keto salad dressing, you have a lot of options not available to non-keto dieters. Non-keto dieters usually go for light dressings without much fat, but on the keto diet, you’re encouraged to eat fat. That gives you a lot of awesome keto salad dressing options. Broccoli Keto Slaw uses a dressing made with a base of avocado oil mayo and apple cider vinegar. Avocado oil mayo is a great choice for the keto diet because it contains zero carbs and plenty of grams of fat per serving to keep you satisfied and in ketosis. Avocado oil mayo is made out of (not a big surprise here…) avocado oil, eggs, vinegar, and various seasonings. It tastes amazing and is a great base for keto salad dressing! You can also peruse the salad dressing aisle at the grocery store. You’ll be amazed by how many keto-friendly salad dressings are out there! How Many Servings are in Broccoli Keto Slaw? There are four servings in this recipe. It’s an easy recipe to double (or triple) if you want more! How Many Carbs are in Broccoli Keto Slaw? This easy keto recipe is super low in carbs. Each serving contains only 6.1 grams of carbs… 2.4 grams of which is fiber! That gives each serving a net carb count of only 3.7 grams. 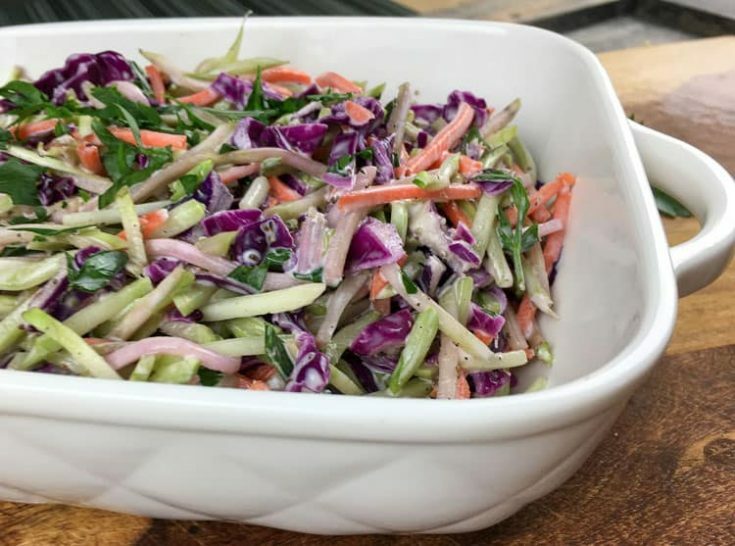 Although this keto slaw relies on the natural sweetness of vegetables (instead of adding sugar like some broccoli slaw recipes), if you’d like to make it a bit sweeter, you can mix in your favorite keto-friendly sweetener with the dressing. You can serve this recipe right away at room temperature… but for best results, cover it and put it in the fridge overnight (or at least for a few hours). This will give the flavors a chance to combine! This Broccoli Keto Slaw tastes amazing when served on Easy Keto Pulled Pork Lettuce Wraps! Head on over to that recipe for the details. It’s also a super easy keto recipe. Want More Keto Diet Recipes? I hope you enjoy Broccoli Keto Slaw! 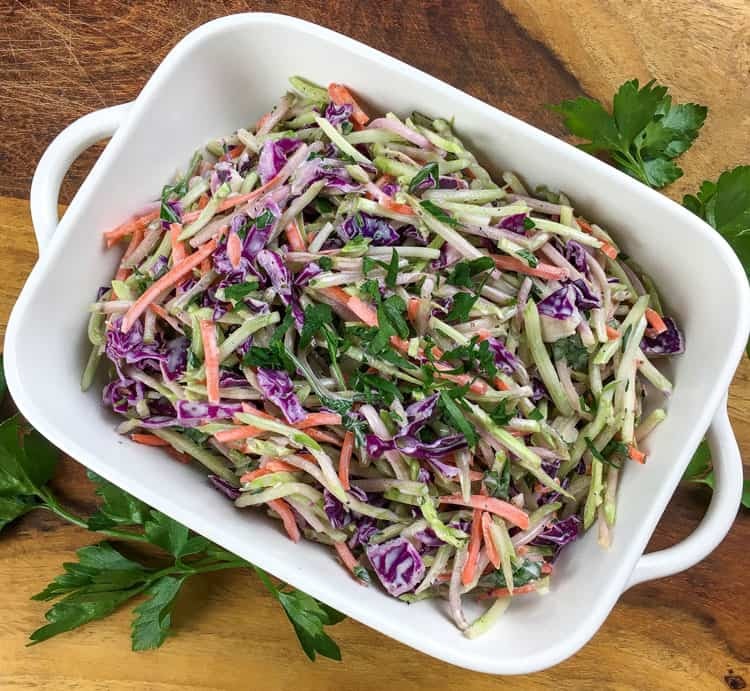 This Broccoli Keto Slaw recipe is a tasty, low-carb slaw that makes a perfect side dish or topping. To a large glass bowl or other non-reactive bowl, add all ingredients except for salt and pepper. Stir to combine, then season with salt and pepper to taste. You can serve the slaw immediately or chill it in the refrigerator for a couple of hours, if desired.